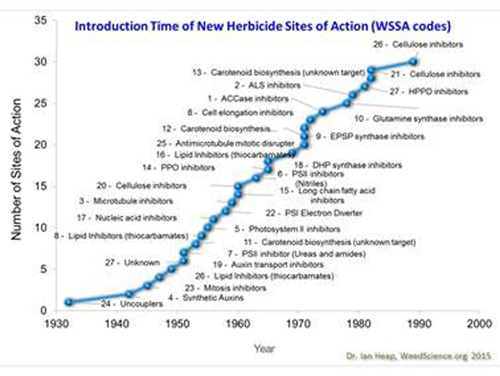 Zasso: Do we need to fear “Peak Herbicide”? The “peak oil” scenarios of the 1960s significantly facilitated the development of a more sustainable energy supply that is now suitably safe for our industrial societies. It also prepared us better for re¬acting to other external factors, such as the need for CO2-reduction due to global warming. While we are still witnessing the discovery of new oil resources, it has become clear that peak discovery will come first, followed with some delay by peak production, depending on how responsibly we use the limited resources. The more limited they are, the more valuable they will become. 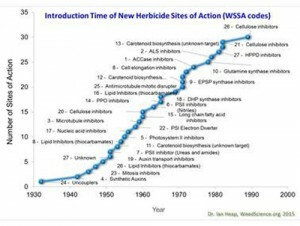 • 28 => years since we discovered the last new herbicide as a mode of action worldwide (cellulose inhibitors in 1989). 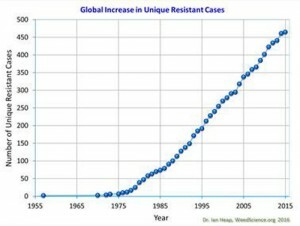 • 13 => the average yearly increase of unique resistance cases (species × site of action) for the last 30 years, with no reduction in sight. 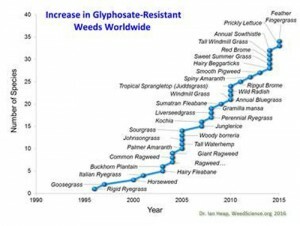 • 35 => the number of glyphosate-resistant weeds worldwide in 2015. But what does this really mean for modern agriculture, herbicide production and the imperative of feeding up to 9.7 billion people in 2050? The numbers seem to suggest that we are running out of new and efficient methods for weed management in modern agriculture. The existing chemical herbicide tools – even though they have become extremely important in reaching sustainable targets like soil conservation or energy saving – are becoming increasingly blunt. 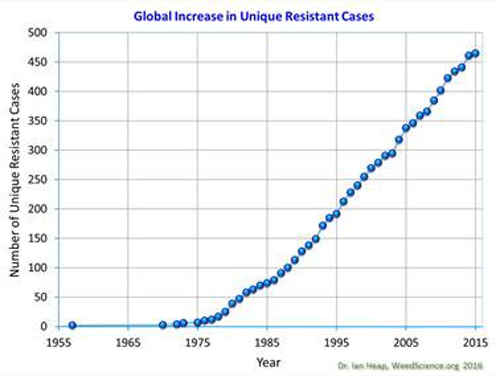 Already farmers in 1.2 million fields are fighting against herbicide resistance and weeds are able to multiply much faster than at linear rates. If the development carries on like this and we have no significant innovation to show for, we will run into a “peak herbicide”, when we lose important herbicides to global resistance developments faster than we can generate yields to feed the world. All these dark future scenarios are not intended to predict the end of the world, but to focus our view on those areas of research and innovation that are important to solve those pressing problems. The Zasso digital herbicide method allows for efficient control of many difficult weeds, especially root-spreading ones like thistles, knotweed or bindweeds, because it damages shoot as well as root systems. 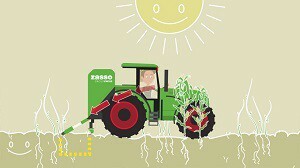 Applying the digital herbicide does not affect soil integrity in any way, nor does it cause new resistances, because the Zasso system is a systemic physical approach – from the top down and right into the roots.The Zasso hybrid weed control concept allows us to extend the lifetime of our dwindling number of certified herbicides. At the same time the chemical input into the environment is significantly lowered – adhering to the clear rules of integrated weed management.